Microdermabrasion is one of the most modern and effective methods of cosmetology and aesthetic medicine. The technique is beneficial for people of all ages, it fastens the skin cell turnover and makes your skin appear youthful and refreshed. 6 to 16 sessions are needed to completely regenerate the skin of the face, neck, shoulders, and hands. Note that the procedure is non-invasive, there are no risks of serious side effects and is not considered time-consuming. 7 Which skin conditions benefit from microdermabrasion? Microdermabrasion is a non-invasive skin resurfacing technique, targetting the outermost layer of the skin. The process itself is painless, it provokes no damage to the skin, whatever the type of microdermabrasion you have chosen (crystal or diamond). The gentle exfoliation does not wound or provoke painful sensation – it only eliminates the dead skin cells and the contaminants accumulated on the epidermis. According to most patients, the sensation is pleasant (most compare it to facial massage), there is no pain. The mechanical irritation can cause only slight reddening of the skin. The American Academy of Dermatology reports that anesthesia is not necessary, as the procedure provokes a slight tingling sensation on the skin. The only negative effect, following a microdermabrasion procedure, is skin redness and increased sensitivity but these side effects typically require a couple of hours until they completely disappear. As expected, the post-procedure treatment is very important – the skin should be deeply moisturized and protected from the sun within the next few days. Depending on the microdermabrasion procedure you are undergoing (crystal or diamond), a single session will take around 30-60 minutes. If you only want to treat the facial area, it will take around 20-30 minutes. The treatment can be performed at a dermatologist office, at a beauty studio or at home. Most microdermabrasion machines for home use require less time plus the added benefit that you can pamper your skin, according to your own convenience. Oily skin – by removing the excessive sebum, clogging your skin pores, you can successfully reduce the number of blackheads, whiteheads, and acne. Clogged pores cannot function properly, they are very prone to irritations they are the reason for the overall dullness of your skin’s complexion. Microdermabrasion will eliminate the sebum, accumulated on the skin surface, letting your pores breathe and regenerate faster. An additional benefit is the shrinking of the enlarged ones. This exfoliating process will also reduce minor scarring, caused by acne. Normal skin – the normal skin type also needs proper exfoliation. Microdermabrasion will remove the dead skin cells, accumulated dirt, makeup residue and other contaminants that may intrude the regeneration processes in the skin cells. Sensitive skin – as microdermabrasion is a form of gentle skin exfoliation, it is not likely to cause severe irritations. However, the side effects (redness and increased sensitivity) may last longer (2-3 days). 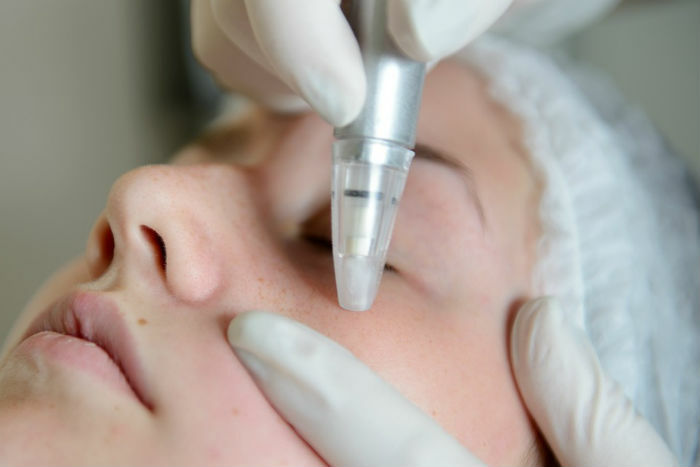 Microdermabrasion can be performed right before special occasions, in case you want to look healthy and refreshed. Boosting the circulation in your skin cells is a must in case you want a radiant, younger-looking and rejuvenated appearance. Blood and lymphatic circulation are extremely important as this is the way your skin gets the nutrients and oxygen needed, while it pushes out the toxins and waste products, responsible for the aging process. Note that usually skin discolorations are caused by the lack of oxygen in the cells. Increasing the blood flow stimulates the proper functioning of the capillaries, improves the overall complexion, helps your skin regenerate and slows down the natural aging course. Patients, suffering mild to moderate acne can benefit from the procedure, as it will clean and shrink the facial pores, reducing the chances of potential infection. Additionally, the skincare products applied after the procedure will enhance their efficacy, as your skin will be clean and able to absorb the ingredients needed. They will penetrate deeply into the skin, as there will be no dead cells or contaminants, which often impede the process. By promoting blood circulation, the healing process speeds up, leaving the skin nourished and refreshed. Additionally, patients can benefit from the vacuum feature provided. Comedones and blackheads (which are caused by clogged pores) can be easily and effectively extracted thanks to the suction option, which is the final step of the microdermabrasion procedure. Fine lines and wrinkles can be significantly reduced thanks to microdermabrasion sessions. This is due to the fact that such a gentle, yet deep exfoliation makes both fine lines and deep wrinkles less visible, while also stimulates the renewal of the cells. As expected, deeper wrinkles cannot be completely eliminated, as they are caused by prolonged exposure to ultraviolet light, breaking down your skin’s connective tissue (composed by collagen and elastin fibers). The procedure will only improve their appearance, but will not eliminate deep wrinkles. Deep scarring will not magically disappear after a microdermabrasion treatment, especially if you have years-old damage. The procedure will make your scars less visible and will stimulate the regrowth of new, healthy cells. Discolorations, following scars, will also become less visible. Depending on the type of your scar, you may need to perform an additional treatment in order to reduce the damage, caused to the skin. There are multiple options available (in the form of creams, gels, and ointments) which will additionally help improve the condition of the scar. These products, when applied directly after a microdermabrasion procedure, will provide a better effect, as the healing ingredients will be better absorbed. This procedure allows deep penetration into the skin and treatment of old and stubborn pigment spots, as well as those acquired due to improper exposure to the sun. The technique is beneficial for people of all ages, it fastens the skin cell turnover and makes your skin appear youthful and refreshed.